Over the past decade, it has become much more common for employers to run a credit check on potential candidates. This has become even more prevalent as the number of available of jobs is limited and the number of qualified applicants increases. However, many people still do not understand why their credit score matters in regards to employment and how their credit score may affect their job search. Here is a quick look at what your credit score is used for and how it could affect your job search. In 1998, the SHRM (Society for Human Resource Management) took a poll and found that only 25% of employers did a credit check on prospective candidates. By 2006, more than 43% of all employers were doing this. Since the economy is in a period of slow growth, employers can be a little pickier when choosing new hires. With this being the case, more than half of all employers now use credit reports. 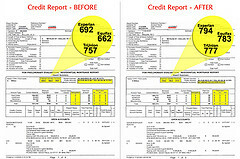 Why Will Companies Check Your Credit Score? This is a common question that many people are asking. Unfortunately, they are asking the wrong question. When a potential employer gets a verified credit report, it will not include your credit rating, credit score, or any indication of how good or bad your credit is. What they will receive is a credit history based upon information that can be found using public records. This can include issues like prior bankruptcies, payment history, and tax liens. Why Do Companies Check Your Credit History? There are a variety of different reasons a company may want to check your credit score before offering you a position. In many cases, this process is used simply to verify who you are. Identifying information like social security cards and drivers licenses can be forged fairly easily, whereas credit reports are fairly reliable. Another reason that employers may want to see your credit history is because it can be an indication of how you handle credit responsibilities, which can provide insight into your character and how you manage your own lifestyle. How Can This Affect Your Job Search? If you have a poor credit history, there is a chance that you will not be able to easily find a position in a financial-related field such as working for banks/lending institutions, cash handling positions, or any position that provides you with sensitive information. Keep in mind that in order for an employer to gain access to your credit history, you will have to sign a consent form. If you know that they will doing a credit check, being proactive and addressing the issue right away can go a long way in limiting the damage that your credit history could cause. This is especially true if you can discuss what caused your financial issues as well as describe steps that you have taken to fix them. In short, your credit score can in no way affect your job search, however your credit history can. Stay alert for any instances in which your potential employer wants to you sign a consent agreement so that they can gather credit related information about you. If this happens, address the potential issues that they may uncover. This can go a long way to minimizing any negative impact that your credit history can have on your potential job opportunities. Jason Kay is a professional resume writer and regular contributor to JobGoRound.com, which provides job search tips, interview advice, and resume service reviews. served in the position bank which gives cash or secret information you cannot find position in the field which is related.